Goodreads Summary: Jason Dessen is walking home through the chilly Chicago streets one night, looking forward to a quiet evening in front of the fireplace with his wife, Daniela, and their son, Charlie—when his reality shatters. When Jason awakes, he’s in a lab, strapped to a gurney—and a man he’s never seen before is cheerily telling him “welcome back!” Jason soon learns that in this world he’s woken up to, his house is not his house. His wife is not his wife. His son was never born. And someone is hunting him. What did I think? 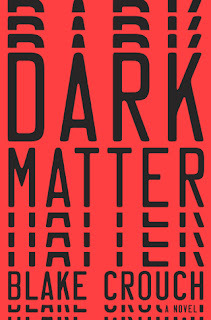 It's a bit difficult to review Dark Matter, to be honest, because basically anything I can say about the philosophical questions it poses would give part of the plot away. Don't read up on it, just read it with all of its surprises. The most important thing you need to know is this: I read it in one sitting. 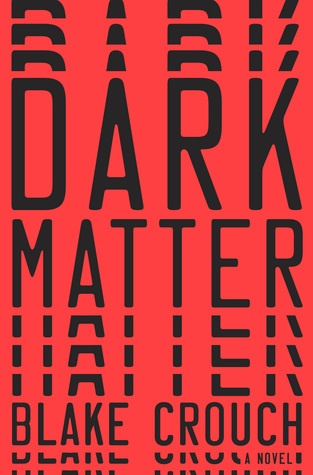 Dark Matter is a little over 300 pages and I started reading one afternoon and I refused to make dinner until I was done. I literally could not put it down. If it weren't for that aspect I'd probably have given it 3 stars. Why, you ask? Because despite it being a thrilling story that asks some deep philosophical questions and offers an original and creative premise, I was somewhat disappointed by the final act. It starts out great, even the dreaded slow middle is fantastic. The entire book feels more like a movie than a book, that's how fast the plot moves forward. I predicted the twist, but only because I'd read similar books. While the beginning and middle are surprising and original, sadly, the ending is a bit too neat and played out exactly as I thought it would. I would have appreciated and even expected Blake Crouch to take the story one step further, which he failed to do. Nonetheless definitely worth a read if only because of its addictive nature. Great non-spoiler review! I liked this book a lot. It was a fun, fast read that made me severely dizzy. What a wonderful review! I've been wanting to read this book ever since a friend read it and loved it! We have similar reading tastes and I think I'd like the book! Now so happy to hear you like it too! Sorry about the disappointment at the ending though! Nice review! Pretty sure I want to read this book right now. I loved this book too! I agree that you should go into this one blind. It definitely made me think! My husband read this one recently and enjoyed it. He would tell me bits and pieces and he read and while it sounded interesting it didn't seem like one I would be interested in. He's now reading another by Crouch called Pines and I think he's enjoying this one even more. I heard of Pines, I should definitely pick it up!